What are your top-performing pages telling you? Your website’s top-performing pages quickly allow you to see what information users are most drawn to and measure the overall health of your law firm’s content marketing hub. Having access to Google Analytics metrics will help you refine current content marketing practices and better leverage the most compelling information while enhancing poor-performing content so it’s more relevant to prospective clients in the future. Big-hit pages show your attorneys how a particular website page, such as a recent blog post, is gaining traction, how long users stay on that page, and how quickly users exited that page or left the website altogether. You can leverage these trends and pinpointed analysis to implement changes in content strategy, from formulating new content ideas around topics from top-performing pages to balancing information your law firm wants users to know with the information they deem most relevant. 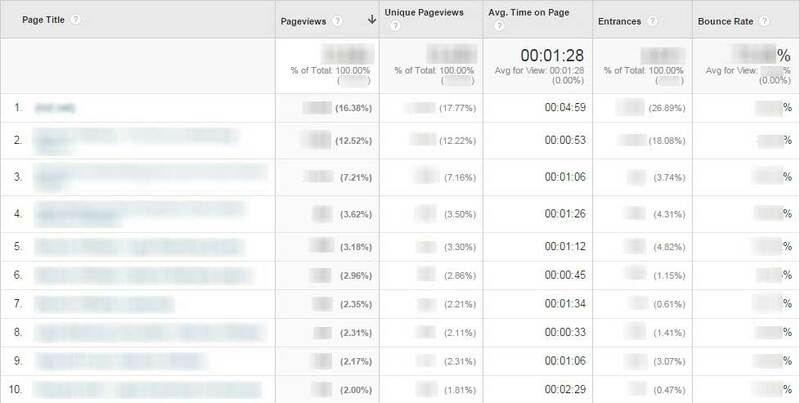 Good content marketing for law firms starts with identifying critical data curated by Google Analytics. 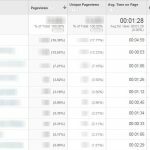 This week we’re providing a guide to finding your most popular pages and what to do with these stats once you have them in hand. Step 1: Log into your Google account. Go to Google Analytics. If you don’t have an account or are unsure of how to access your Google Analytics account, contact Network Affiliates. We would be happy to walk you through it the first time. 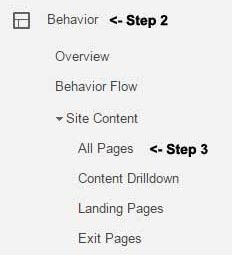 Step 2: From your Google Analytics account, click on the Behavior tab on the left-hand sidebar. Step 3: You will see a drop-down under the Behavior tab. Click on Site Content, then click on All Pages from that drop-down menu. Step 4: From here, your screen should populate with your website’s top 10 best-ranking pages, based on the date range you select from the top. To get a good understanding of truly top-performing pages, consider looking at more than a one-month overview. Try 3-6 months for a broader picture of performance. This way you’ll know that a top performer is not just a random one-off piece of content, such as a holiday blog or big new hire announcement. These could be hot topics one month, but not when you look at them in greater context over a larger period of time. Step 5: Adjust your date range to reflect data you wish to see. Below we’ve selected June 1, 2015-December 31, 2015. At the bottom of the page, you can choose to look at more content, such as the top 25 performing pages. This will provide a better snapshot of your firm’s strongest content, knowing that typically more generic homepage and about sections are almost always among a website’s top-performing pages. This is in the upper right-hand corner of your analytics screen. Step 6: Click on a top-performing page that interests you. A good one to start with is the first page in the list that is not considered part of the typical core pages (about us, contact us, featured work, etc.). For example, that first page in our example is a blog post titled “The Best TV Ad Strategy for Your Money.” Once you select that title, it will bring you to a screen that shows metrics specific to that page. Unique Pageviews: How many of the people who came to a page were there for the very first time. Average Time on Page: Helps convey whether users are actually reading and interacting with content. The longer time on a page, the better chance users are finding the information they want. Bounce Rate: Shows how many users had only a single interaction with your site. In this case, it would mean the user came to the site from this blog post (probably through an ecrm program or social post) and left without going to another page on your site or having any interaction, such as filling out a contact form or clicking to chat. What’s worth changing after analysis? Contact form: If a user enjoyed the information they read, they may be more willing to fill out a contact form to receive more info. It’s easy to add a form to any website page. Newsletter signup: If prospective clients see your page content as part of a social post and decide they want to receive more topics, make sure you offer a way to sign up for your law firm’s regular newsletter. Adding a signup option to the bottom of the page is a smart conversion tactic. Related links: Try adding some related topics as links on the page people like. That way when a user is done reading the initial piece and is still looking for more information, you have it available with no searching required, which could help further interaction with the site. If you see that users are spending a low average time on certain pages that are often a sign that they’re not finding the information they want. Perhaps you need to tweak content on low-performing pages to say something more relevant. If average time on page, bounce rate, and exit rate are all too high, ask yourself if your content is truly useful to the end user. Is there something a reader can truly glean from this content? Is the content easy to read and digest? Is it written at the average reading level? It’s also smart to check design and optimization for both desktop and mobile viewing. For example, if a user is trying to read a piece of content on a mobile device and the site is not truly mobile-friendly that alone could be the reason a prospective client abandons the page. Also, make sure pop-ups or other intrusions are not interrupting the user’s visual experience on each page. Remember to make small tweaks at a time. Changing too many things all at once will make it hard to keep track of what really moves the needle. Another thing to consider is whether all forms of traffic are legitimate. Could spam be messing with your numbers? 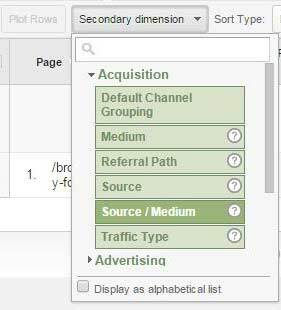 To view sources of traffic leading to a certain page, click on the Secondary dimension tab, scroll to Acquisition and click on Source/Medium. From there, look at the Source/Medium to see if what’s listed there looks like legitimate forms of traffic. 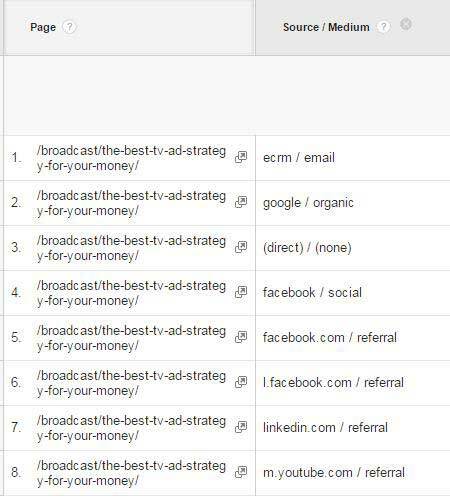 Per our example below, ecrm (email campaign), Google, Facebook, LinkedIn, and YouTube are all legit traffic sources. If you think the URL is spam, do not go to that site. Trending topics: Wondering if a topic is trending up or down? 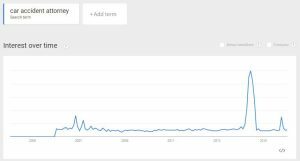 Use Google’s Trends tool to see if the topic is hot or not. The line graph of traffic is a great way to see if a topic is still being searched consistently or has tapered off. If content appears to be tapering off but is still relevant and timely, think about re-sharing it through your social media platforms. If users found a specific piece of content particularly interesting, think about how to create more “parallel” topics to generate more traffic and engage more users. Another idea-generation method for creating fresh content is to ask your firm’s intake specialists about common questions they hear from clients and create topics around those. Real search queries: You can also type real search queries in Google and use the Related Search feature at the bottom of the page to come up with more relevant topics. When to get an attorney and attorney fees are two great topics to add to your site. Visual cues: Make sure any calls to action at the end or within your content are bold or stand out in some way. This will ensure users are getting the information you want them to have—and remember. Likewise, including larger headlines and subheads to break up different sections of text will allow for easy scanning and help readers digest content. Hyperlinks to more relevant information are also important. For example, if your legal website includes a page on motor vehicle accidents, including hyperlinks to related subpages, such as car accidents, truck accidents, and motorcycle accidents, will help users find exactly what they are looking for. We hope these guidelines are helpful and will inspire you to take a fresh look at your law firm’s content marketing efforts. Need additional advice? Don’t hesitate to call Network Affiliates today for a free and confidential market evaluation. 1-888-461-1016.